The first two races of the season are in the books. Since the next best thing to being there is in-car video, here’s PIR https://youtu.be/zKx0JE6zEsA, Pacific https://youtu.be/FD9sIp99l5o and the June 2-3 double race at PIR https://youtu.be/ZSc9On2fvGA. Or, click https://bmwpugetsound.com/the-pro3-line-q3-18/ and click the links. 2018 is starting strong–17 PRO3 cars at PIR and 23 at Pacific. Conference totaled 149 and 131 entries respectively—225 and 210 including the non-points sprint races. And 16 drivers attended the IRDC competition school. There’s another July 20. Top five PRO3 at PIR were Corey Peters 25 points, Dirk Groenveld 22, Matt Lowell 22, Bryce Scott 19, and Rob Johnston 18. During the race, Matt ran a blistering 1:22.8 and eight of the 13 finishers ran in the 1:23s or better. In just his second season, with coaching by IRDC Pres Gama A-G, Dirk took pole in the Mini Enduro—but was bested by wiley Corey in Sunday’s race. At Pacific, David Weller put the Fina #6 on pole with an amazing 1:37.2 qualifying, only to lose the race to Brian Bercovitz in the LUI/Blaupunkt car. Top five were Brian, Corey, Bruce Humberstone, Bryce Scott, and Rob Johnston. As you read this, we will have completed the triple race at Spokane June 15-17 and the Pacific NW Historics June 29-July 1. Coming up–July 21-22 Pacific Raceways, July 27-29 double race at Mission Raceway BC, August 18-19 PIR, September 15-16 a double at the Ridge, and October 13 the Enduro at PIR. 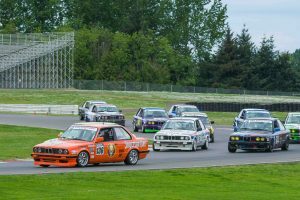 HPDE drivers, you can strut your stuff during an actual race weekend July 21-22 at Pacific. Check the schedules and drivers entered at motorsportsreg.com and the race results at ICSCC.com. Despite the unfortunate departure of up-and-comer Mike Bailey and his entourage, this year has seen an influx of new talent (Nor Coquillard), new cars (Matt Lowell and #217), old cars in new hands (TicTac-Mark Carpenter, Nardella’s-Mike Roy, Tim Mineo’s-John Parkinson), old cars in new liveries (Corey Peters), and the resurrection of cars thought departed e.g. Beef Wellington’s- guibo failure at Mission ventilated the passenger cabin—like flack in a fighter plane. Dave Bennitt and Bruce Boyd’s beautiful car, Watson, is still for sale. The first two race weekends did involve some mechanical issues: Jeff McAffer’s engine at PIR, broken shifters (Hulk-man Corey Peters), torn subframes (Matt Lowell), flat tire (Kyle Byers), failed clutch master cylinder (Mirko Frequia), and other gremlins. Even the mighty Blue Baron #137 had a loose caliper. Bill Ecker’s spidey-sense detected a sound during the non-points race pace lap, and he returned to the pits for repairs. Going to race pace in that condition could have led up to a full Cissell. Never go full Cissell. Now, most folks know that Jim, an old guy late to racing, will never win a race–except for that Enduro at Pacific where he was the only ME2 car to keep on racing after a major oil spill. But most agree that his videos are educational (learning the right line by watching other drivers pull away), exciting (bumper-to-bumper action), and fun (Jim laughing at himself). But at Pacific, one driver said the videos were a waste of time-there was nothing to learn-Jim drove the wrong line-the captions were stupid. Undeterred, Jim plans to keep trying to make people laugh. Because, is there anything better than sharing laughs and thrills with friends at the race track?! Even Jim learned some things at Pacific. 1-Do not go on a track while hung over. You may be safe but you will be slower—seven seconds first session. 2-Make sure your hands don’t hit your camlock. At PIR, Jim’s new Sparco belts weren’t a problem. But on Pacific’s 3B hairpin, three times in three sessions his left hand hit the camlock and released his belts. It got a bit hairy as you’ll see in the video. You’ll also see lots of Kevin Doyle. Two drivers in his stable, Corey Peters and Matt Lowell, are doing great this year. At Pacific he rebuilt two cars and got them back on track—Gordon Winters’ front end in two hours and Matt Lowell’s subframe in four hours. And last December, KD Motorsports captured back-to-back 25 Hours of Thunderhill victories in E2. Drivers Kevin, Corey, and Matt give the credit to their crew chief, PRO3’s David Stenner, who held it all together despite losing every gear but 4th, no oil pressure, and metal on metal on the rear brakes. Plus, the team won by five laps and turned its fastest lap of 2:06 in the middle of the night, with “Big Deal” Doyle at the wheel. We’ve got some pretty amazing folks in PRO3. We’ll feature more of them, as well as workers and fans, in future videos and issues of PRO3 Line. So, come on out to a race. Bring your friends and family. Or volunteer to work a race weekend. It takes an army to make it happen—corner workers, control tower, timing and scoring, registration, starting grid, etc. In addition to experiencing racing up close and very personal, you’ll get free meals, travel stipends, and free/discounted lodging—it varies by club. Call or email Bill or Jim and they’ll hook you up. Get good at it and you can work races all over the world. Many ICSCC workers can be found at F1 and NASCAR races from COTA to LeMans. 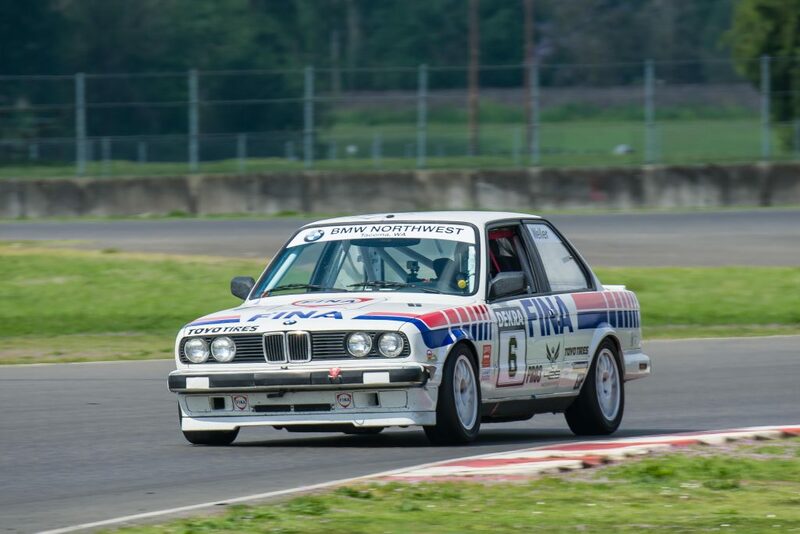 Thanks again to all our readers, viewers, volunteers, long-suffering significant others, and sponsors—Toyo Tires, BMW Northwest, Griots Garage, 425 Motorsports, Advanced Auto Fabrication, Proformance Racing School, and of course, BMW CCA. P.S. Special incentives PRO3 drivers: Every IRDC member who enters all four club races (Ridge is a double), gets a $150 credit toward 2019 entries. And, if we get over 20 entries for Pacific July 20, the drawing winner gets a free IRDC entry to be used within one year. All photos courtesy of Doug Berger.